Me and my lovely intern Märta are working on a new project. This time it is for my shop sammyrose. I can not tell you much at this point. Just show you this sneakpeak and tell you that we find our inspiration in Astrid Lindgren´s Madicken, Candy Canes (polkagrisar) and TV. Newer Post 24-days of December	Older Post Dellas tutu! mm vad bra saker att inspireras av! Snygg bild. Den skulle kunna bli affisch! Ni är så härligt kreativa. Underbart! 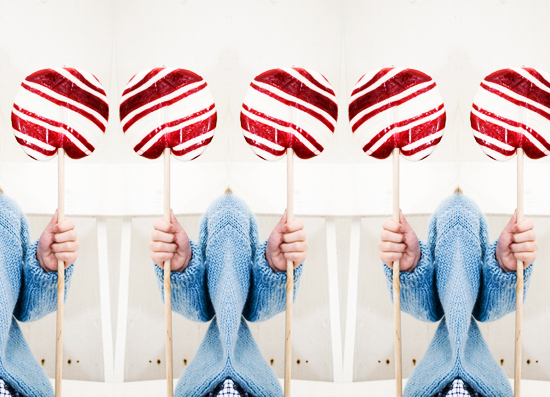 Ska bli kul att se resultatet sen.
love those lollies, funnily I too am going through a red/white and candy cane phase! Härligt krispig bild. Vid första anblicken tänker jag på en startklar “raketfisk”, som bara genom att släppa sina färgglada “ballonger” åker iväg mot nya äventyr. I’ll go on tour with you. Looking forward to seeing where you’ll take us. sorry, a bit confused – comment was ment for the advent calendar tour.